We climb the rock in the late afternoon. We do not meet many other visitors, besides some groups of youngsters (Koreans?) and elderly people. The climb is done by stairs and a bit of not too serious rock climbing. Depending on one’s physical condition, one can reach the top in roughly twenty minutes. The view was a bit disappointing, also because it was a little hazy. Water, soft drinks and a small assortment of Islamic souvenirs can be bought at the top. The mosque is one of the tiniest you can imagine, eight people at the most will fit in. A sweaty group of men comes out, catching air and buying water. It is said the mayor of Osh wants to build a ski lift on Solomon’s Rock. A lift could bring more people to the top in an easy way. It is said that Central Asian muslims consider visiting this rock three times, equal to the hadj to Mecca. Of course such a lift will give an economical upheaval to the city: more visitors and tourists will visit the place, which means: jobs and money for which the region is in dire need. People opposed to the plan say there is much vagueness about the safety. The rock is said to be built on a sandy foundation. What happens if the lift brings up, as planned, 300 people every 5 minutes? Can the rock hold this kind of weight and movement? Recently the local government held a press conference about this issue, but they spilt not a word about safety precautions or environmental issues. They do not have any feasibility reports; it seems the authorities of Osh have not yet studied the consequences of their plans very well. Another contra argument are the ancient inscriptions in the rock, they should be preserved. 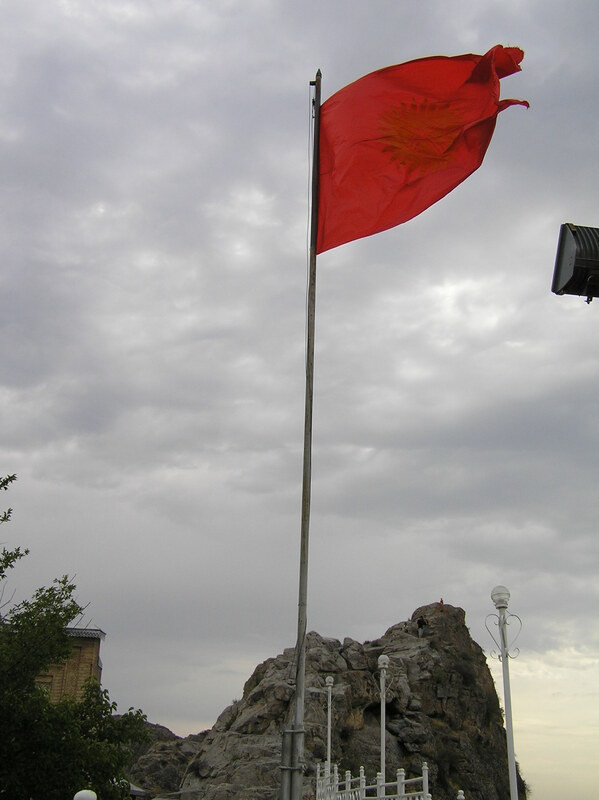 Due to the rock the inhabitants of Osh know their city is more then 3000 years old. The oppositionists say the rock could be on the Unesco World Heritage list, but of course the mayor will not put much of an effort into this because then it will be impossible to build a lift to the top. And finally: rumours go the Islamic Development Bank is behind the plan. In a nutshell this heated discussion about the plans for a lift shows some of Osh’s main troubles. Firstly people do not trust the authorities and expect them to be corrupt. Secondly there is fear for the rising influence of religion. Although the majority of the people are Kyrgyz, the people in power seem to all have the Russian ethnicity. Serious ethnic clashes occurred here and in nearby Uzgen in 1990. A small story like this brings together commercial, environmental, ethnic and religious elements. And we know what happens what can happen when people start locking themselves in their own ethnic and or religious niches. Distrust and hostility can grow, and one group will wish to rule the other. Whether or not this lift will ever be built, is not the point. It is the discussion about this lift that shows, as the temperature of the tolerance in the city of Osh. It is a fierce landmark, fleeting above the city. The huge proud Kyrgyz flag, red with a golden sun in the middle, attracts the attention. I presume every first time visitor of this place will feel the urge to tame the rock. Also in an attempt to get some grip on the slightly frenzied city. Although this will be a nearly impossible endeavor in this jungle of houses, buildings, cars and buses with its Uzbeki, Kyrgyzian, Russian and Tajik inhabitants who swarm streets of Osh, a city in southern Kyrgyzstan. With about 300.000 inhabitants Osh – the second biggest city of Kyrgyzstan – is rather flat. The city sprawls across the valley of the Ak-Buura (White Came) river. It is said to be one of the region’s ancient cities with a history dating back at least to the 5th century BC. It is said that ‘Osh is older than Rome’. The city certainly must have been a major hub on the Silk Road from its earliest days. The enormous bazaar offers mainly food: fresh and dry fruits, vegetables, cheese, milk, a variety of bread and of course meat from a variety of animals. The non food section is occupied by ugly and cheap looking Chinese products. The dust dims the colors of this relaxed but lively city centre, with lots of pleasant shadowy terraces with sofa’s on which you can enjoy a lunch and slowly drink loads of tea until the hottest hours of the day have passed. It has been a Muslim place of pilgrimage for centuries, supposedly because the Prophet Mohammed once prayed here. In 1497 the king of Fergana built himself a little shelter and private mosque on the rock. In later years this came to be an attraction in its own right. It collapsed in an earthquake in 1853 and was rebuilt. After a mysterious explosion in the 1960’s – people say it was a Soviet attempt to halt the persistent pilgrim traffic – it was rebuilt again after independence, according to the good, old Lonely Planet. For ages this region has been a cross road for religions and cultures, mixed with the political winds and ethnical waves. These all come together in the disagreement about the plans for building a ski lift on that not very impressive stony hill. Sad enough, it is not a soapstory. The Rancillio is a solid beauty. 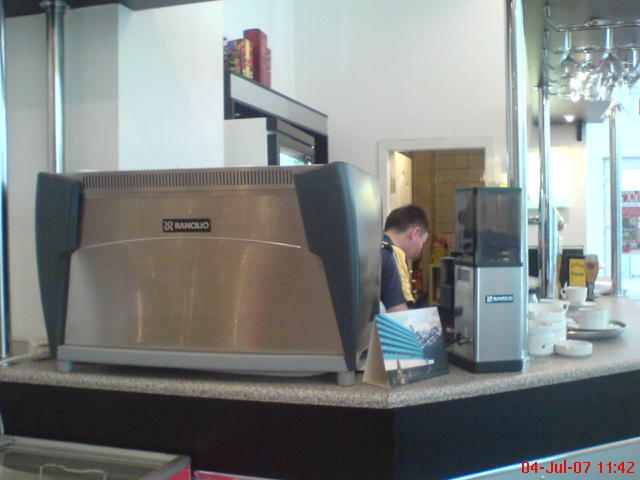 This mid range espresso machine, including the right grinder can be a promising start for a fine espresso. The lobby of this top end hotel in Almaty (Kazakhstan) seems a good place for this machine. But grinding the beans too fine, pulling the shot for too long (more then 30 secs, instead of about 20 secs) is delivering an espresso which is lukewarm and quite sour. I tried twice, with different barista’s. Then I gave up. It seems Almaty has the money to buy this kind of excellent machines, but has not developed yet the taste to fully enjoy its power.